A recent decision of the New Zealand High Court has held that the test for defining the composition of creditor classes in a creditors’ compromise involves consideration not only of creditors’ rights but also their economic interests. This article considers the law on composition of creditor classes in New Zealand and in other jurisdictions that have adopted compromise laws based on the English model. It suggests that the test adopted by the New Zealand High Court (and upheld by the Court of Appeal) is open to challenge and is unlikely to have more general application outside of New Zealand law, given the unique framing of the relevant insolvency laws in New Zealand. The New Zealand law has effectively collapsed the more usual three-stage compromise regime into a two-stage process, involving the creditors’ vote and only one court hearing. It is suggested that in the New Zealand context it is appropriate to consider the differences in economic interests of creditors on the occurrence of a complaint by a creditor of unfair prejudice, which effectively corresponds to the approval hearing in other jurisdictions. This article considers the interaction of the statutory rights of action in rem contained in the Admiralty Act 1988 (Cth) and the cross-border insolvency law contained in the Cross- Border Insolvency Act 2008 (Cth). It first considers the nature of the security interest held by a maritime claimant who arrests a vessel after availing themselves of a statutory right of action in rem. It argues that such claimants only acquire a right that the Marshal perform his duty to sell the vessel and pay the claimant out of the proceeds of sale. 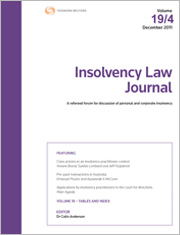 The article then investigates how that right is dealt with by Australia’s cross-border insolvency regime, and argues that it is sufficient to exempt such claimants from the stay imposed on actions against insolvent companies. For the PDF version of the table of contents, click here: Westlaw AU – Insolv LJ Vol 26 No 1 Contents or here: Checkpoint – Insolv LJ Vol 26 No 1 Contents.